I don’t know if you’ve ever tried to pair wine with eggs, but boy, is it difficult! When you opt for breakfast for dinner — a.k.a. brinner — the challenge can be enough of a struggle that you end up going with a mug of tea. 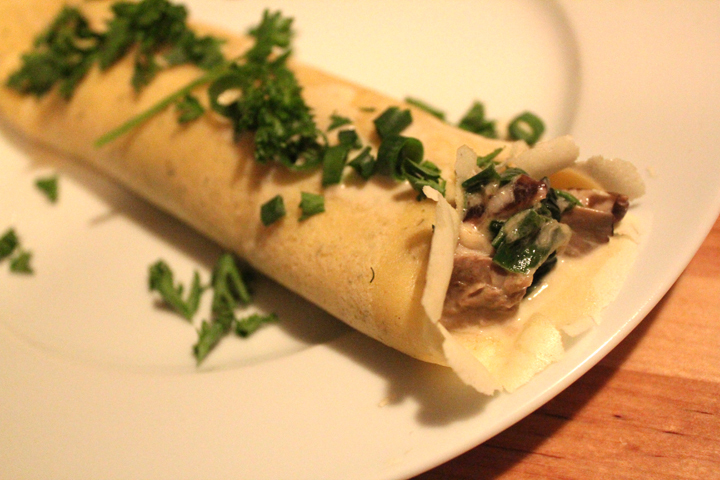 The other night, I decided that crepes would make for a perfect evening. It’s easy to make the recipe gluten-free, and savory crepes seem so fancy when presented on a plate, scattered with a garnish and filling the house with the tangy aroma of onions and the woodsy tickle of mushrooms. But what to pair with our lavish meal? As luck would have it, Charles and Crystal — whom also works in the wine section — had just sampled an Alsace wine that Crystal thought would compliment the crepes. It was Hugel’s Gentil, and it really was perfect with our savory supper. Maybe I won’t feel quite so intimidated pairing an egg dish after this success. Combine all ingredients in a blender and pulse until smooth. Put in refrigerator for one hour. Warm a non-stick skillet on medium-low heat. Coat with butter and then pour crepe batter in, turning the skillet, only pouring in enough to cover the bottom of the pan. let cook about 30 seconds and flip, letting it cook another 30 seconds. Remove and let cool on the counter, a cutting board, or a large plate. Repeat until all crepes are cooked. Any unused crepes — there will be a few — can be put in the freezer for later. In the same skillet, cook the mushrooms down until liquid is released. You may need a teensy bit more butter for the pan to keep the mushies from sticking. Add the green onions and spinach and cook until the spinach is wilted. Add the cream and Parmesan and cook until until cheese is melted. Tip the pan so some of the liquid drains off and spoon filling into two crepes. You can either place the filling in the middle of the crepe and fold over each side or place the filling on the right side of each crepe and roll to the left. Drizzle with some of the sauce leftover in the pan and garnish with parsley.